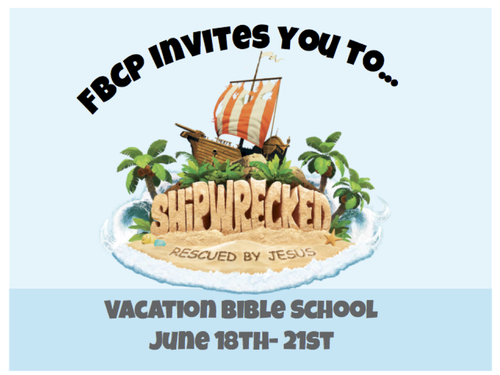 We would like to invite you to get "shipwrecked" with us this year at VBS. At 5:45 dinner will be served in the fellowship hall to kick off each night! For children ranging from 4 to completing fifth grade, we invite you to join us for VBS. For adults, a Bible study will be held upstairs. If your are attending the adult Bible study, a nursery will be available, but please register your child for it. We look forward to seeing you soon. Please email children@fbcpendleton.org with any questions you may have.